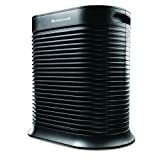 Honeywell - HPA300 : Air Purifier Review • The Air Geeks, reviews of air conditioners, dehumidifiers and air purifiers. The air we breathe is full of contaminants. Some of these pollutants are harmful especially to allergic people. Honeywell knows this, and has been bringing to the market many air purifiers in the recent years. They progressively got more efficient, quiet and stylish, and here we are with the HPA300. The HPA300 is designed and optimized to remove various types of pollutants from the air that goes through it. It is specially engineered to eliminate allergens and ensure that they don’t reach your nostrils. This allergen remover is ideal for relatively large rooms. Apart from eliminating airborne germs and particles, the HPA300 is optimized to remove bad smell from the air that goes through it. It is well designed to ensure that your room gets fresh air that is free from common air contaminants. In case you are tired of tolerating dirty and smelly air and you are planning to get an air cleaning system, then you should consider this unit. It offers impressive features and a good performance. Let us inspect further. The HPA300 is based on the true HEPA filtration mechanism. This highly effective filtration mechanism captures nearly all airborne particles. This ensures that the air you breathe is clean and free from various types of contaminants that are usually suspended in the air we inhale. This air purifier is capable of removing 99.97% of airborne contaminants from the air. Pollutants come in different sizes depending on their type. This unit is optimized to trap even the smallest particles. According to the manufacture, the HPA300 can capture particles that are as small as 0.3 microns. For people who are allergic, this allergen remover is ideal for your air purification needs. This unit is designed to capture dust, cooking smoke, tobacco smoke, mold spores, pollen, and pet dander to name a few. In addition, this unit is specially designed to capture germs that are suspended in the air. This ensures that the air in your room is completely clean for your respiratory system. Apart from removing various airborne particles from the air that goes through it, this 22″ wide, 23 1/2″ high, 13″ deep allergen remover is also optimized to eliminate bad smell from your room. You should not allow bad smell from your pets to dominate the air in your living room. Kitchen activities can also fill your rooms with various types of unpleasant smells. This air purifier features an activated carbon filter that effectively removes all kinds of odors. While the intake air is in the front, it is the exhausted air on the top of the machine. The pre-filter is also suitable for capturing pet fur, dust, and lint. The effectiveness of an air purifier is dependent on the size of a room where it is used. Some units are designed for large rooms while others are only suitable for relatively small rooms. This powerful unit is ideal for large rooms. The HPA300 is suitable for rooms that are as large as 400-500 Sq Ft., no small feat for a general-public air purifier. Air purifiers utilize various mechanisms to ensure that the air in your room is clean, pure, and fresh. Air circulation is one of the mechanisms that they use to ensure that the air does not stagnate in your house. This unit is designed to offer a high rate of air circulation. According to the manufacturer, this air cleaner is capable of circulating the air in your room five times within one hour. With this system in your house, you can be sure that there will be no room for stale air. The Association of Home Appliance Manufacturers (AHAM) is a popular body that certifies various appliances. The HPA300 is an AHAM certified product and meets all their strict requirements. With a Clean Air Delivery Rate (CADR) of 300, this air purifier is a powerful unit that is ideal for your air purification needs. If you have been tolerating airborne particles and bad smell, you need to carefully consider this unit. It will transform the environment of your room and make sure that dirt and bad smell don’t find their way into your nostrils. Very quiet system. This system is optimized to run quietly and does not produce noisy sounds that you may get from some competing air purifiers. Highly effective. This unit delivers great performance and ensures that allergens, dirt, and bad smell are removed in a 400-500 sq ft space. Defective door. A minor issue is that the unit’s front cover is poorly designed and has weak attachments, on the left side latch that does not "lock" properly. More expensive than some model in competition. However, the durability of the product is such that in the long run, this pays for itself many times over. This HEPA filter does a great job at removing particles and dirt from the air. After running the filter for approximately 6 hours, the evidence of its high performance as dust/dirt/allergen collector could be seen on the pre-filter. I can definitely notice a difference in the air quality after using this unit. The only small negative that does not earn this product 5 stars is the minor annoying left side latch that does not "lock" properly (this problem is noted in other reviews). This was not enough of a problem for me to return the product. I remedied this by adding a small piece of self-adhesive velcro just under the locking point." Noticed air quality improvement within 24 hours. Everyone in our area is saying the pollen this spring is horrible, and even getting into their homes. Our whole family is having no allergy symptoms this year! As others have stated, read the information and direction sheets before opening the unit. Installing the filters and removing the door is very simple if you follow the directions, and you will avoid damage to the spring loaded door locks. Push only at the marked locations, and push both sides simultaneously." We are impressed by what Honeywell has achieved in the recent years. The HPA300 is a powerful unit that effectively removes allergens at an impressive rate. It employs the true HEPA technology to ensure that various types of contaminants are removed from the air that goes through it. Its stylish design and impressive performance makes it an ideal air cleaner for most people’s home. In spite of minor details that, however, did not go unnoticed by our teams, we clearly have a winner here. Going by the features and performance of this unit, it clearly deserves a high rating of 4/5.